I know you are probably reading this and saying who ? Well let me explain !! Friday 24th November 1972 Rangers reserves secure a 5-1 win over Dumbarton at Boghead. Listed as N0 11 in the Rangers lineup is “Newman”, who is in fact 17-year-old Icelandic trialist Ásgeir Sigurvinsson. Former Ranger Albert Gudmundsson contacted his one time teammate Willie Waddell and gave him a heads up on the youngster, and he was invited to Ibrox for a months trial. Reserve coach Stan Anderson’s comments after that game he said “Ásgeir Sigurvinsson had a good debut, but he trained before the game and looks a fair prospect”. I am almost certain I saw him play in a reserve game at Ibrox but his stay at Rangers was short-lived and he returned to is club IBV. So what happened to the young Sigurvinsson ? Well read on. 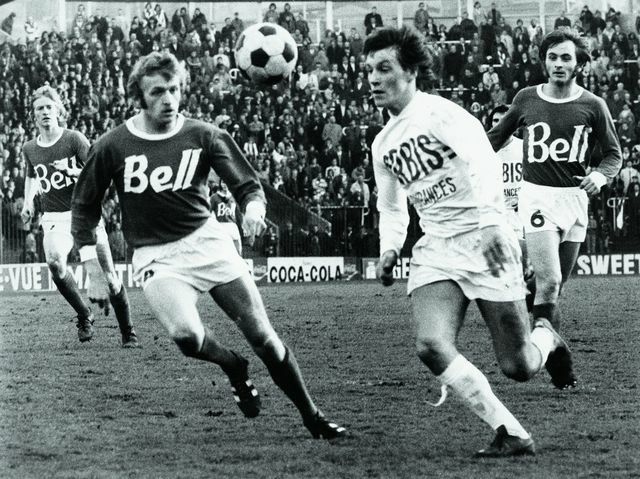 In 1973 he moved to Belgian club Standard Liege, where he made over 300 appearances, culminating in a Belgian Cup win in 1981 when Standard beat KSC Lokeren in the final. His performances there resulted in a move to Bayern Munich. He had at difficult season at the Bundesliga giants and after only one season moved to VfB Stuttgart where he really took off. 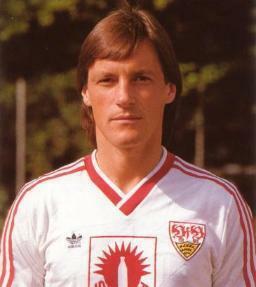 He established himself as a regular in the side and in season 1983-84 he played a prominent role when VfB Stuttgart clinched the championship for the first time in 32 years, with Sigurvinsson contributing 12 goals in his 31 appearances. He was voted the Bundesliga midfield player of the year that season. 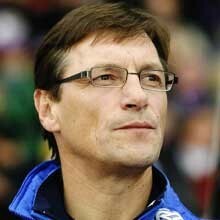 With the previous winner being Felix Magath and his successor being Lothar Matthäus, it gives an indication of his quality. He also featured in both legs of the 1989 Uefa Cup Final when VfB Stuttgart lost 5-4 on aggregate to a Diego Maradona inspired Napoli. Coming from a small country like Iceland his opportunities to shine at international level were limited. He did gain 45 caps for his country and I remember a frustrated Wales manager Mike England’s post match interview in 1981. With Wales sitting in a great position in the group qualifiers for Spain ’82, they had just played Iceland in the penultimate qualifying game at home. He was describing how he warned his players about the “world-class” talent in the Iceland side, Ásgeir Sigurvinsson has just scored both Iceland’s goals in a 2-2 draw and the Welsh failed to qualify. He went on to manage the national side from 2003 to 2005 and to celebrate UEFA’s 50th anniversary in 2004 each of its member associations was asked by UEFA to choose one of its own players as the single most outstanding player of the past 50 years (1954–2003). The 52 players were known as the Golden Players. Of course the selection of the Icelandic FA was Ásgeir Sigurvinsson. This entry was posted on July 25, 2011 at 2:19 pm and is filed under Glasgow Rangers, Uncategorized, youth development. You can follow any responses to this entry through the RSS 2.0 feed. You can leave a response, or trackback from your own site.